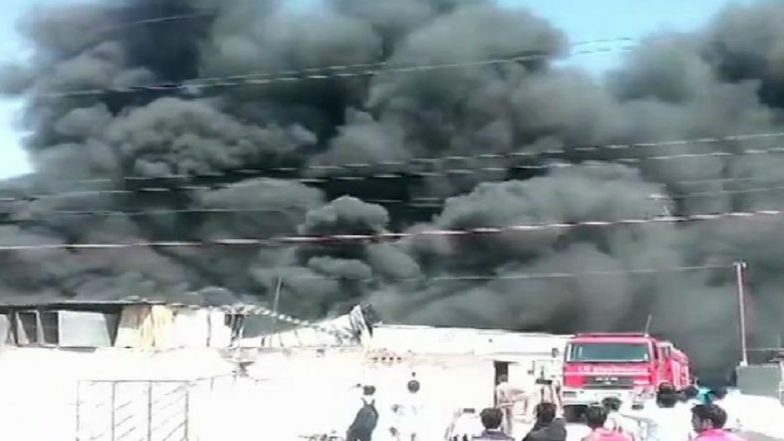 Noida, March 25: In a tragic incident, a fire broke out in a thermocol factory located at the industrial area of Kasna Site 5 in Uttar Pradesh’s Great Noida on Tuesday. At least six fire tenders are present at the spot. Meanwhile, no casualties have been reported yet. Firefighting operation is underway. However, the cause of the fire is yet to be ascertained. Massive Blaze in Noida Factory, 16 Fire Tenders Rushed. According to reports, around 300 employees were present on the premises of the factory when the blaze broke out. The factory is located near LG intersection of Greater Noida. More details are still awaited. In February this year, a massive fire broke out on the third and fourth floor of the Metro Hospital in Sector 12 of Noida. No patient was injured in the fire. The fire broke out at a time when operations were underway in operation theatre of the hospital.